Two Christians face charges of kidnapping and forcible conversion in India after Hindu extremists attacked them and children on their way to a youth Bible conference by train, sources said. The Hindu extremists later savagely beat Christian parents trying to regain custody of their children at a police station, the sources said. The extremists had police detain the Christian children for a week, while the two Christians charged were held longer. "I am shocked at the way the Hindu extremists take law into their hands with impunity knowing that the government is theirs," one of those facing charges, Amrit Kumar Matera, told Morning Star News. Christians Anita Francis and her daughter, 19-year-old Sophia Francis, on Oct. 23 boarded the Avantika Express bound for Mumbai from a railway station in Indore, Madhya Pradesh, with seven children - four boys ages 5, 13, 17 and 17, and three girls ages 5, 12 and 13. Having secured permission from the children's Christian parents, the women were taking the children to a Bible study program for youth from throughout India. They had boarded the train and were settled in their seats when a throng of Hindu extremists from the Hindu nationalist Hindu Jagran Manch, an affiliate of the Rashtriya Swayamsevak Sangh (RSS), the ideological parent of the ruling Bharatiya Janata Party, barged into their compartment and forced them off the train, sources said. They began to interrogate Anita Francis, asking why they were going to Mumbai and how much money they had received to convert the children to Christianity, said her nephew, Alex Matera, 19, who along with his father, Amrit Kumar Matera, had come to see her and Sophia Francis off. Having boarded the train to help settle the women and children, Alex Matera and his 53-year-old father also became targets of the Hindu extremist assault, with the latter detained along with Anita Francis and the seven children. "They interrogated us as if they were from the Crime Branch and recorded the entire episode on their mobile phones," Alex Matera told Morning Star News. "They gathered the children from where they were seated and collected them all at one place, interrogating and intimidating Anita without even giving her the chance to reply. The children were pushed and pulled in the most ruthless manner." He tried explaining to them that all the passengers were baptized Christians going to a Bible study conference as they do every year, he said. "We were astonished," Alex Matera said. "We don't know how these people got to know about the travel plans. They alleged we convert children forcibly." Local media have published false reports that he, his father and aunt were taking the children to Kerala state to carry out conversions, he said. "The tickets were pre-booked for return journey on Oct. 26 from Mumbai to Indore," he said. "That was not enough to convince them." Anita Francis immediately telephoned the children's parents, who hurriedly headed for the railway station. Amrit Kumar Matera said that all seven children were relatives and neighbors of Anita Francis who live in the same colony as she does. "Three men caught me from behind and started to hit me with their legs and boots," he told Morning Star News. "I could not even see who was holding me and what they were beating me with. They beat me all the way through, while they dragged me to the GRP [Government Railway Police] police station from the platform." The Hindu extremists man-handled the children, beating some of them, and they had called media to witness the Christians' purported "kidnapping" of the children, Amrit Kumar Matera said. "There was a mob waiting at the platform with media persons clicking pictures, recording videos and asking all kinds of questions," he said. "The presence of the media and the crowd was evidence enough that the Christians were ambushed with a well-planned strategy." On the train station platform, the Hindu extremists began to beat him, his son Alex and the three older boys, Amrit Kumar Matera said. Another witness, Tanna Machado, a relative of Anita Francis, arrived at the train station after Francis called her. "The 13-year-old boy was hit on his back and on his leg so severely that he developed swelling on his leg," Machado told Morning Star News. The Hindu extremists verbally abused Anita Francis with the filthiest of language, said Amrit Kumar Matera, adding they spoke "words that I cannot even repeat as a Christian." The worst was yet to come. Shouting slogans elevating Hinduism and trying to force the Christians to repeat them, the Hindu extremists assaulted and dragged the Christians toward the GRP office, Amrit Kumar Matera said. "They tried to force us to hail Hindu gods, and when we did not, they beat us," he said. "They intimidated the children to repeat the slogans or else face the beating. The 5-year-old boy and girl were made to chant the slogan, 'Hail lord Ram' repeatedly. We felt so helpless as they intimidated the little children before our eyes, and we could do nothing to help them." 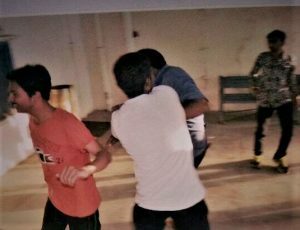 While the detainees were seated inside the station-in-charge's office at the GRP, the parents of the children arrived, and the Hindu extremists pounced on them and assaulted them as well, witnesses said. "The Hindu Jagran Manch workers assaulted the Christian men in the presence of the police staff, who stood there as mere spectators," Machado said. "I along with another girl tried to rescue the men but to no success." The Hindu extremists also beat Dennis Michael, father of three children - 12, 13 and 17 - among the children going to Mumbai. He arrived at the railway station despite having a broken leg from an accident he suffered earlier, and the Hindu extremists beat him ceaselessly, repeatedly striking his broken leg with boots, Machado said. "They accused him of sending his child with the Christians to be converted," she said. Aman Chauhan, Christian father of the 5-year-old boy, was also assaulted, along with other parents. As he has a Hindi name, the Hindu extremists accused him of changing his religion, witnesses said. Amrit Kumar Matera said the Hindu extremists also beat his son, Alex Matera, while police did nothing, he said. "There was a huge gathering outside the police station so that police could not arrest the assailants troubling us, which actually was their primary duty in that situation," he told Morning Star News. Police released Sophie Francis and Alex Matera at about 11 p.m., while Amrit Kumar Matera and Anita Francis remained in custody. Anita Francis and Amrit Kumar Matera were charged with kidnapping (Section 363 of the Indian Penal Code), punishable by up to seven years in prison and/or a fine; forcible conversion under sections 3 and 4 of the Madhya Pradesh Freedom of Religion Act, punishable by up to two years in prison and/or a fine; trafficking of minors (section 370), punishable by 14 years to life in prison; crime with common intention (section 34 of the IPC); insulting the religion of any class (section 295A of the IPC), punishable by up to three years and/or a fine; obscene acts or songs (annoying others, Section 294), punishable by prison up to three months and/or a fine; voluntarily causing grievous hurt (Section 325), punishable by up to seven years in prison; mischief by destroying or moving a landmark fixed by public authority (Section 434), punishable by up to one year in prison and/or a fine; and sexual harassment (section 354). They were sent to the Musa Khedi Jail, Indore, that evening. Later Amrit Kumar Matera was also charged under the POCSO Act (Protection of Children from Sexual Offenses Act-sexual assault). Except for some initial contact, parents who arrived at the police station were not allowed to meet with or even see their children, sources said. The parents got only a glimpse of them from the window of the room where they were locked up when the children were finally taken to a restroom, they said. "What was inhuman was that the children were not allowed to use the restrooms since the time they were detained until 7 p.m. at night," Machado said. "They were neither given anything to eat until late night." While police questioned the Christian adults, they sent the seven children to the government-run Maharaja Yashwantrao Hospital for medical examination. Machado and a companion followed police as they drove the children to the hospital, where she and her friend were astonished to find that no medical examination was performed on them. "The children were taken for medical check-up by the police without their parents," Machado told Morning Star News. "The medical staff only asked each child their name and then sent them back." The children were not brought back to the police station but were taken to secret locations that were not revealed to the parents, sources said. The girls were taken to an ashram (Hindu monastery) near the railway station, while the boys were taken to a children's home on the outskirts of the city, according to Amrit Kumar Matera, who said he learned this during High Court proceedings. The parents were not able to see or speak with their children in the days that ensued. They attempted to file a complaint at the local police station, but their efforts ended in frustration, sources said. With the aid of Christian leaders, the parents filed for Habeas Corpus at the Indore bench of the Madhya Pradesh High Court to try to get their children released. Dennis Michael, one of the parents, filed the petition on behalf of all the parents stating that they were concerned about the safety of their children and that the entire attack was politically motivated. The petition named a Hindu nationalist member who had instigated the assault, asserting, "The constitutional rights of the petitioners have been imperiled by illegal detention of their children without any reason." The Habeas Corpus petition hearing took place on Oct. 30, and the bench presided by Justices S.C. Sharma and Alok Verma ordered the prosecution to produce the children. The court asked each child individually whose custody they would like to return to, sources said. All the children told the court that they would like to return to their parents, and the children were handed over to their families - a week after they were first detained. The court also ordered the home secretary and the in-charge of the Indore GRP station to file a detailed report. Anita Francis and Amrit Kumar Matera were released on bail on Nov. 3 after their attorney submitted the high court's Habeas Corpus ruling and supporting affidavits from the parents in the sessions court. "The judiciary intervention was God's plan; it is a miracle," Amrit Kumar Matera told Morning Star News. The charges remain, and both of the accused, who are teachers, have been trying to cope with the stigma of being jailed for 10 days. Anita Francis is a well-respected retiree, while Amrit Kumar Matera has taught at the St. Arnold School, Vijay Nagar, Indore, for the past 21 years. "I have not gone back to the school," he said. "It is embarrassing to answer questions about my jail stay." The Rev. Vijayesh Lal, general secretary of the Evangelical Fellowship of India, said this was the third case this year of children being detained by authorities in Madhya Pradesh over charges of forcible conversion. In May, 72 children going to a Bible camp were detained by police in Ratlam and Indore, and in June Sister Beena Joseph was detained by police in Satna while traveling with a minor girl. "Earlier as well, in 2015, there have been cases wherein a child as young as 8 months old was detained with the mother on charges of conversion," Lal said. "We also recorded an incident wherein a family of four from Bhopal was arrested near Chhindwara on alleged conversion charges, and children were separated from parents and kept in separate jails which were over 150 kilometers apart." Law enforcement agencies are working under pressure from non-state political actors, he said, "and go the extra mile to placate them, while Christians pay the price. This must stop, and the chief minister must intervene to restore confidence among the Christian community, which has been unnecessarily targeted by the abuse of the so-called Freedom of Religion Law as an excuse." The counsel for the Christians, K.P. Gangore, told Morning Star News that he filed a petition questioning why the police have not registered a First Information Report (FIR) against those who threatened and beat the accused, children and their parents. "We also questioned the illegal detention of children without the permission of parents," he Gangore said. "The illegal detention lasted for seven days. The children had to spend seven days in shelter home." The case has been delayed apparently because prosecutors have not submitted their replies to defense statements, he said. The officer in charge of the railway station police, K.L. Varkade, declined to comment on the detention of the children. "We did not register an FIR against the children, but only the adults, and the investigation is underway," he said. State police officials remained unavailable for comment. A source who requested anonymity said the court is tense. "Some 100 lawyers are opposing the counsel appearing for the Christians," the source said. "This is a sample of the adverse situation of Christians in India right now. The media are thronging to cover the victims. Their address also is given out in the reports. This will only make them feel more unsafe. Why is nobody collecting the comments of the home secretary and police officials? Why are media not questioning the authorities?" The source lamented that no mainstream media are condemning false charges against the Christians, and that such cases leave Christians afraid to travel, curtailing freedom of movement. The parents and their children are petrified, Alex Matera said. "They are worried what happens next," he said. "When the children are Christians by birth, from where arises the question of forced conversion?" Requesting prayer for the parents and children, Amrit Kumar Matera said the ordeal is forcing them to have stronger faith. "We have become stronger in faith," he said. "It's a battle, and in the end Jesus Christ will come out victorious. Whatever has happened to us is for the glory of God. We want Him to be glorified."